Whilst looking for another classic track (Our Love Is History by Mai Tai), I came across Thinking About Your Loving by Skipworth & Turner on Digital Eargasm, surely the ugliest blog with the worst ever name. Lucky they have some classic tracks on there. 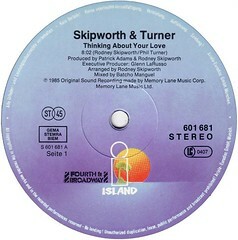 I thought Skipworth & Turner were a couple (think I'm getting them mixed up with Ashford & Simpson). In fact they were two Americans with pretty naff hats that had mild success in the mid-eighties, plus one really big hit, Thinking About Your Loving. I loved this tune, but when I listened to it again it seemed r-e-a-l-l-y slow. Thank goodness for Timestreach (for Mac), a program that I bought for changing the speed of music without changing the pitch; the sound quality's good, it's cheap, but it could do with some more features. Usually you need to go to +2% or +4% to get a slowish track sounding right. I pushed this one up to +12%, shaving a whole minute off it! I think it sounds much better like that. The original would have modern dancefloors asleep on their feet. So, download the Jason Fist 'speed-up' version here. You'll still find some of Skipworth & Turner's records, including pikey new remixes, on amazon. lol...Thanks for the kind words concerning Digital Eargasm!